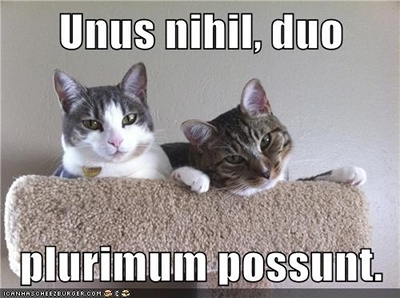 So, for the #OpenTeachingOU round-up this week, there is some FABULOUS stuff to report. What a great week! And for more, check out the #OpenTeachingOU Omnifeed (thank you, Inoreader! ), and also previous news round-ups. Rob Reynolds, NextThought CPO. 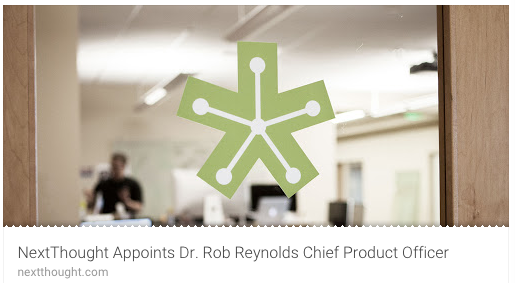 Given OU's ginormous investment in NextThought, I thought this should count as "OU Folks," especially since I am so happy about it: Rob Reynolds is now Chief Product Officer at NextThought, and we can see his work already taking effect. They have a real website now, and a real blog! 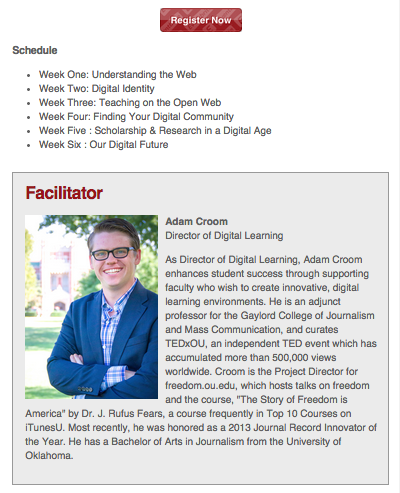 Faculty Learning Community: Online Presence and Digital Identity. I was THRILLED to see that the upcoming FLC from Adam Croom already has a web presence of its own! I hope to join in even if I cannot participate in the face-to-face. Domains Do Disney. Adam was also at ELI this week and shared this fantastic blog post with an update on create.ou.edu. There are some faculty blogs here I have to explore, so expect more goodness here in the OU section next week! 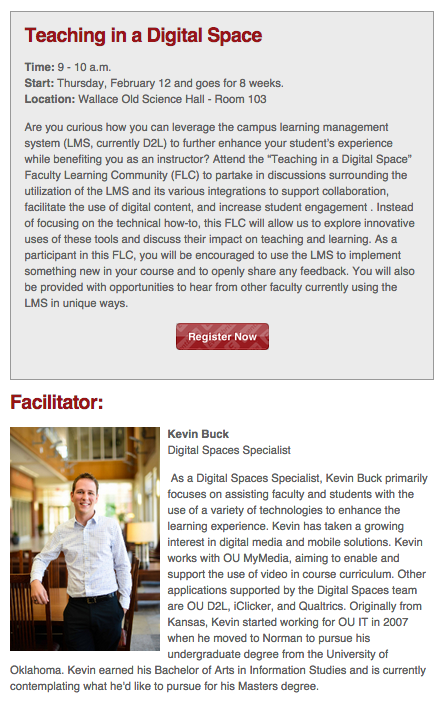 Faculty Learning Community: Teaching in a Digital Space. Another great FLC, and one that I hope will leave a digital trail also. Kevin Buck says he will blog it! Yes!!!!!! We need some good Kevin energy for D2L... the John Baker webinar was not exactly a toe-tapper this week (maybe others got something out of it; I listened attentively but had nothing to take away). President Boren on Twitter. 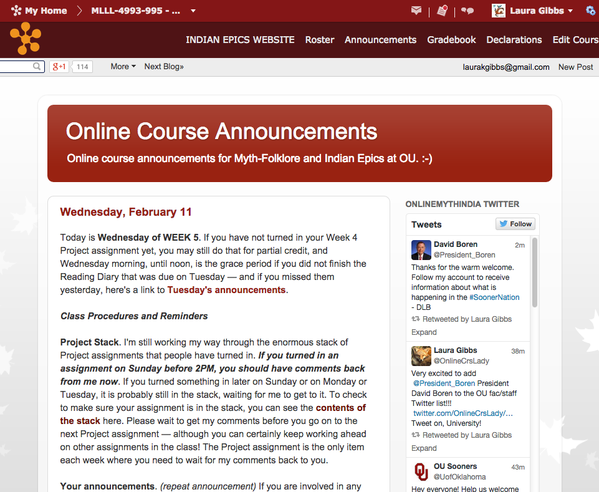 Yes, President Boren has a Twitter account now... so, thanks to the power of the Twitter widget in D2L, President Boren was there to greet my students when they logged in! Striving for a Pedagogy of Empowerment: Taking a Leap of Faith. Beautiful piece from Mia Zamora: "A truly wise person learns from every person he or she connects with in the most unforeseen moments. 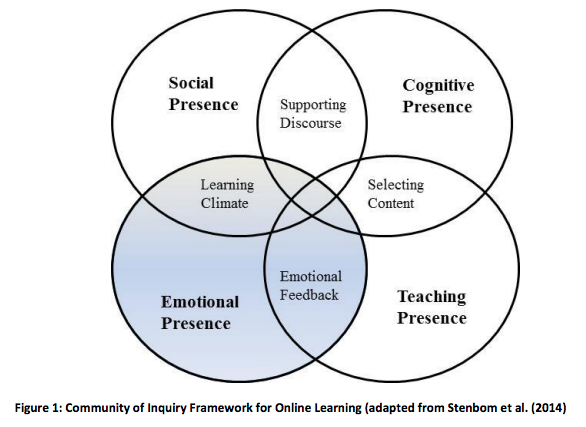 This is of course the soul of co-learning. And, perhaps it is also the seed of equity and justice." 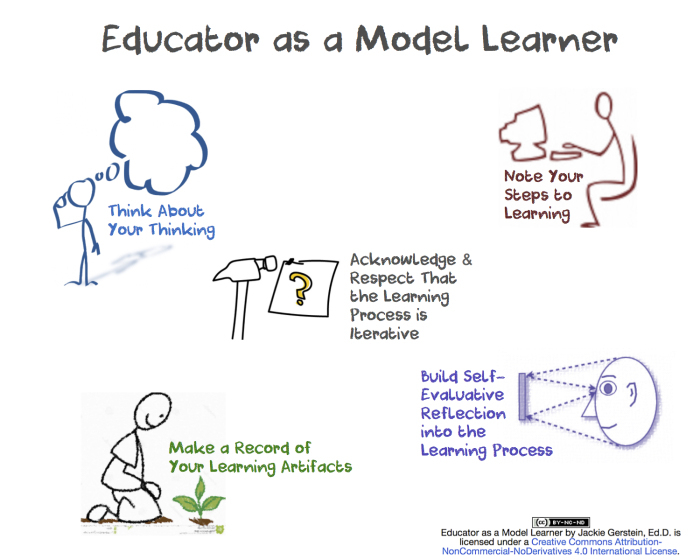 Educators as Lead Learners. More on colearning and making learning visible, this time about our learning as instructors, from Jackie Gerstein, with a great graphic as always! NMC Horizon Report. Great comments from Stephen Downes: "So what does it tell us about the methodology? Mostly, that it sways in the breeze. It's strongly influenced by the popular press and marketing campaigns. It's not based on a deep knowledge significant technology developments, but rather focuses on surface-level chatter and opinion. And that is why I think NMC should be obligated to re-examine its methodology.﻿"
Before You Assign That Homework — What Students Wish You Knew. Great post from Pernille Ripp with much for higher ed here too. I am esp. a fan of the strategy that we should be doing our own homework. Critical Digital Pedagogy. Beautiful and very thought-provoking slides from Jesse Stommel. Ugh: That Grading Article in Chronicle Vitae. Terrible and depressing article, but at least it led to a good conversation re: very important topic of grading. Data Schmata: Midterm Grade Reports. Yep, no comments. Again. It's big data deja vu all over again! Making Learning Visible: Power of Past Student Work. Preliminary report on the way availability of Portfolios from last semester is changing things BIG TIME in my classes this semester; I'll have more on this next week. 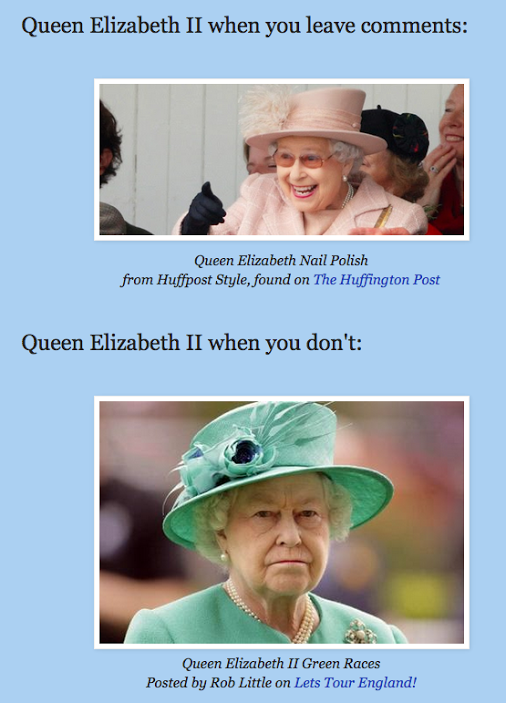 Pinterest Project Boards. 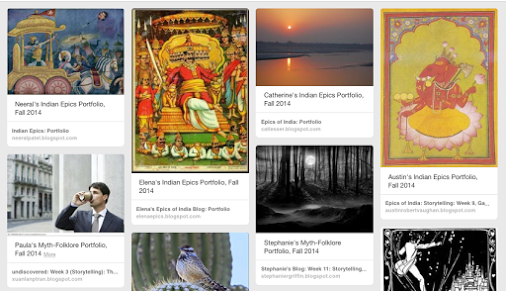 Excited to have Pinterest Project Boards running now, and I embedded them in the Project Directories for both classes! Student Project Comments. Exciting week coming up: students begin commenting on each other's projects. I've revamped that assignment and am hoping for even better things than in past! Student Schedule Update. 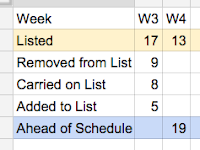 I'm continuing my "small data" project for the semester, seeing what more I can do to get students to develop their own schedules instead of doing work based on my (arbitrary) deadlines. 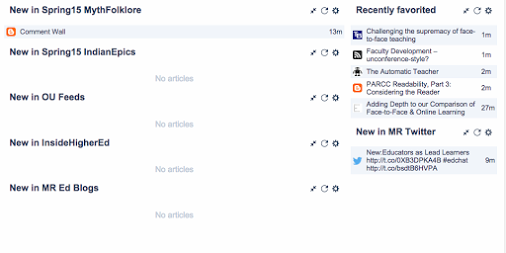 Inoreader Dashboard. I am so happy with my new strategy for using Inoreader's Dashboard options! Below is my #OpenTeachingOU round-up for this week, and you can find previous round-ups here too. I am really pleased that I managed to tag at least one item every day this week, and the beginning-of-semester rush has settled down, so I can hopefully start reading more widely. I am badly behind on people's blogs, but blogs are patient: in the coming week, I will try to catch up on some of my favorites. Youth Community Informatics Studio. 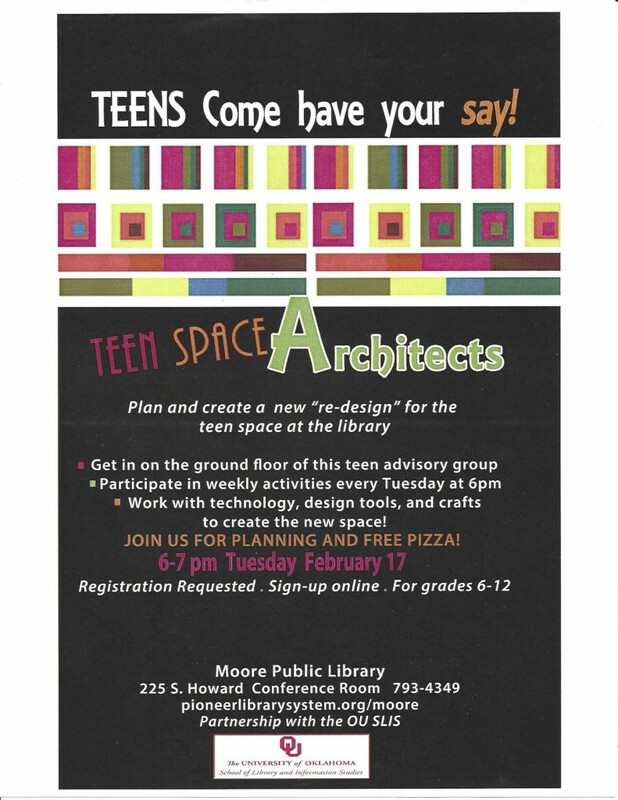 Wonderful, very informative blog post from Colin Rhinesmith about his new community-engagement course, "Leadership in Information Organizations" where they are working with the Moore Public Library. It sounds exciting! Adentures in Digital Humanities. The open set-up that Katherine Pandora is using for this "dream course" means there are new things we can all see and learn about every week. 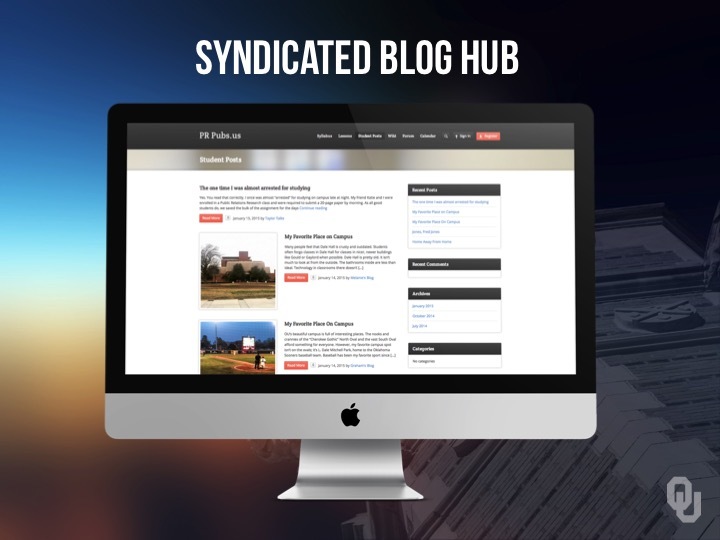 The group blogs, for example, are up and running! What is Your Motivation for Learning? Very useful post from College of Liberal Studies about students and motivation. I like the idea of thinking about motivation from different angles... because it's true: different students are differently motivated, as are teachers too of course! PRPubs Pinterest. 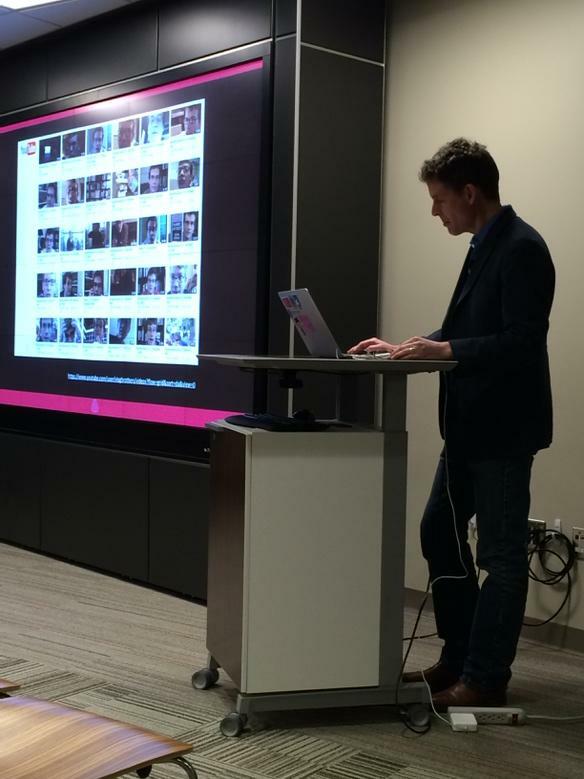 At Twitter Adam Croom shared a Pinterest project that is part of his PRPubs class. I would be glad to know of other examples of open teaching going on at OU this semester! Bad News for Online Learning in Annual Report & “Unsustainable” MOOCS are Full Steam Ahead. You will find lots of write-ups of the Babson report data, but the one that got to the issues that most concern me is this post from Debbie Morrison. Online Teaching: A New Beginning. And here's a nice counter-point to the Babson report: a guest post at Michelle Pacansky-Brock's blog about an online instructor's explorations and discoveries. What Are Your Favorite Faculty Development Blogs? I was so glad to see Debbie Morrison and Michelle Pacansky-Brock on this list from the Chronicle's ProfHacker blog, and I look forward to exploring and finding more! Desperately Seeking the Unique Pedagogical Characteristics of Face to Face Teaching. Excellent post from Tony Bates turns the Babson report upside down: instead of asking online to prove itself, he is asking defenders of face-to-face to please explain just what exclusive claims they have to teaching efficacy. Coursera Sets Sights on Universities. Yes, the megalomania at Coursera never stops: they still want us to believe that their courses are so good that universities can use them instead of teachers. I kid you not. No need for in-house expertise. Just buy Coursera. Ka-ching. Instructure Releases 4th Security Audit. This is not about teaching but it is a nice write-up from Phil Hill about the importance of transparency, and I think it is no accident that Instructure is being transparent about its security audits, just as Instructure built an LMS that allows instructors to decide whether their content is open or not. Ford Foundation, Open Access and Really Sharing Knowledge. Excellent post from Nancy White about openness, something to read together with Phil's Instructure post above. As I see it, the closed design of D2L, where instructors cannot share their teaching or their teaching materials even if they want to do so, is probably the single biggest barrier to our pedagogical progress. So, again: another reason for #OpenTeachingOU. We've got to get out of the D2L lockdown and start sharing more online! Does It Matter Whether Students Recognize What We Do As Teachers? This post from Pernille Ripp also reinforces my sense of why OpenTeaching is so important: it matters to our students too, perhaps more than any other audience! What if Contentment is the Answer? Beautiful post from John Spencer about how contentment can lead to more and better risk-taking: confidence, not complacency. How Medium Is Building a New Kind of Company with No Managers. Lots of good analogies for education here: this reaction against dehumanizing styles of business management would also work very well as a reaction against dehumanizing education styles as well. Engagement: I Do Not Think It Memes What You Think It Memes. 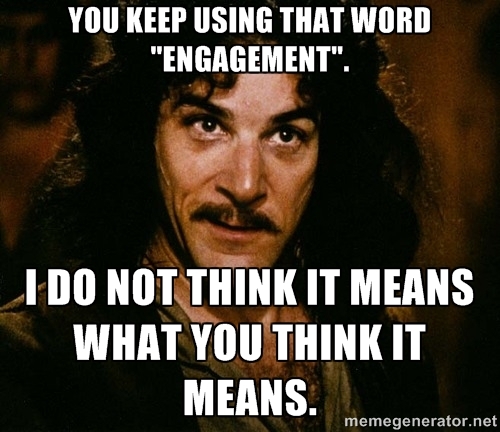 Very thought-provoking post from Terry Elliott about engagement as something that must be reciprocal and not just stimulus-response (a bit like my post about interaction from last week... but with better memes, ha ha). Storytelling Posts. I really like being able to share the student blog posts in a dedicated stream; this week I shared the stories coming in from the Myth-Folklore class. I also shared their reading diaries, and it is the stories in those diaries that provide the raw materials for their storytelling later in the week. 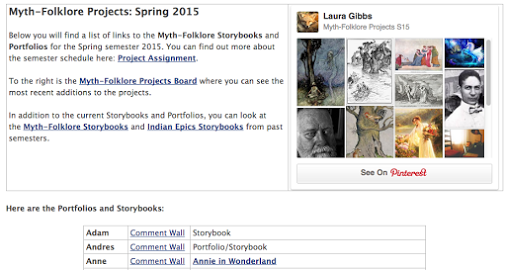 Coming soon: the Storybook websites are taking shape for this semester, as are the Portfolios! Spring 2015: Grace Period Reminder Tracking. This is the blog post where I'll be providing an overview of my "little data" experiment for this semester, trying different interventions with students who are chronically late with work for class. The post is updated now for Weeks 3 and 4. 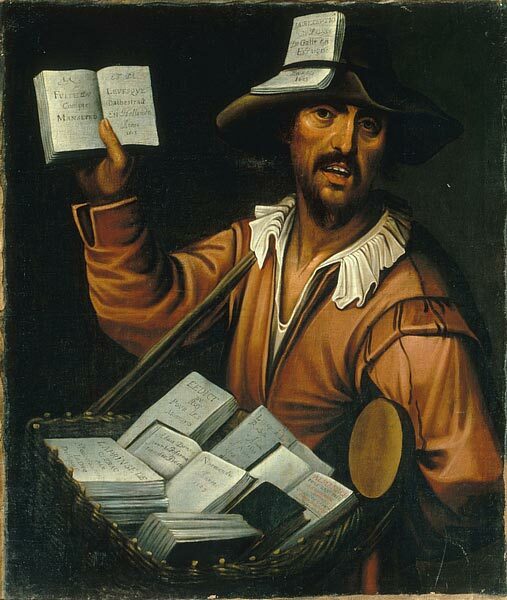 And as an image this week, I wanted to share this great painting of a "colporteur" (17th-century France). It showed up in one of the book-oriented Twitter feeds I follow, and I thought it was beautiful: I feel like a colporteur for my students, singing the praises of the books... but the books I offer are free! Whoo-hoo! Long live the public domain and the open Internet! Katherine Pandora. The big open teaching news this week at OU was all the great sharing that happened via Twitter because of Katherine Pandora's dream course and the visit by Michael Peter Edson from the Smithsonian. You can follow Katherine at Twitter for more goodness to come, and, even better, you can visit the open class site: adventures in digital humanities. Are Schools Failing Extroverts? Great post from John Spencer on extroverted students. As an "ambivert" (ha ha), I really appreciate how the online environment can be GREAT both for extroverts and also for introverts! FUN: The One Thing We Forget to Plan For. Wonderful post from Pernille Ripp about fun. Sadly, so much of college teaching proclaims its rigor. I vote for fun! "Learning should be fun. Curiosity should have a place in our classrooms. Laughter should happen on a regular basis. Smiling should be a classroom rule. Fun should be one of the many pillars that supports all of the learning that we do. It should be embraced, discussed, worked on and celebrated. Schools should be filled with fun." Questions to Ask Oneself While Designing Learning Activities. Such a great post from Jackie Gerstein and, yes, fun is one of the questions! Helping a Perfectionist Child Worry Less and Do More. From Jessica Lahey at New York Times - I would guess that perfectionism is probably the single biggest barrier to changing how we teach... and it's also the biggest barrier to Open Teaching I suspect. A lot of academics don't want to share things openly that are less than perfect. That's not a problem for me, ha ha — I'm a recovering perfectionist, and my recovery is going very well. 10 Things the Best Digital Teachers Do. From Jesse Stommel over at Chronicle Vitae (which does NOT have RSS, alas)... a very good list! I esp. endorse this one: GRADE LESS. Or, even better, not at all; here are my thoughts on grading. High Impact Online. Although I was dismayed by the idea that someone as savvy as Matt Reed had no idea what would be a high impact practice online, people chimed in with lots of ideas. I even left a couple comments there because this is such an important topic. As a result of a follow-up convo at Twitter with Debbie Morrison, I learned this great acronym: HIP, high-impact practice. I want to be an online hippie, ha ha, a "high-impact practitioner." What Professors Actually Do. My response to Scott Walker of Wisconsin: if we practice OPEN TEACHING, then people would have a much better idea of what professors actually do. Especially those of us (instructors, not professors) who teach full-time! Course Evaluation Data: We're Skewing Low, Not High. And here are some numbers that demonstrate WHY those of us who are teaching online need to be sharing our ideas and experience: the course evaluations for online courses in my college skew low rather than high. In my opinion, the incredible potential of online education would mean the numbers should skew high, not low... but that is not going to happen until online instructors themselves start sharing and learning together online IMO. Interaction Entre Nous... NOT Machines. My thoughts on the word "interaction" as prompted by a thought-provoking back-and-forth with someone in my campus's IT department. New "Comment Training" Strategy. I am SO HAPPY with how this "Comment Training" experiment is going so far. It's something I wish I had done years ago in my courses! Change. 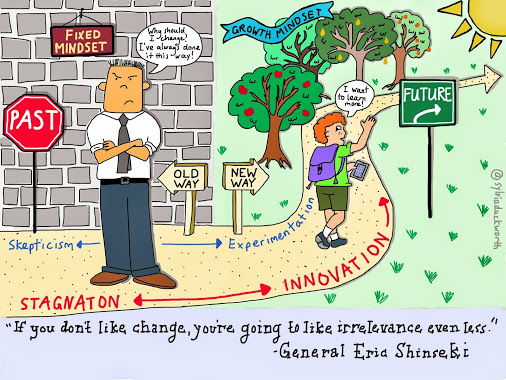 If you don't like change, you're going to like irrelevance even less.